I have to admit that I have always been “a player” of golf, began in my backyard, progressed to the range, and finally 18+ holes. I never had much interest in “watching” others play when I was younger. I always wanted to be outside “doing” and practicing, rather than inside, watching. Obviously, that has changed as I watch nearly every tournament, due in no small part to the availability of High Definition Television. And, in small part, because I do not play competitively any longer, so I am not as obsessed with practice these days. The Masters, however, was a different story. As I wrote earlier, the Masters signified the “official” beginning of the season for me. My high school’s golf team (which I was a member of) began their season right after this week. That carried with it excitement that reached beyond the buzz in Agusta for me. 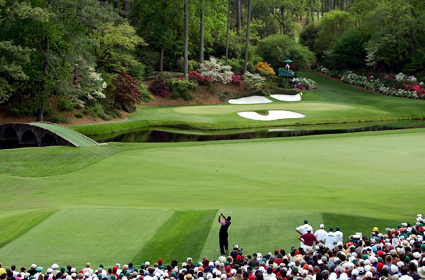 I think every hacker watches the Masters in hopes of one day playing in it. I remember my grandfather, who was my first coach, and his excitement on Masters Thursday. We would watch the final round on Sunday and he would point certain things out to me that these players, who were the best in the world, were doing and elaborate on “how” they did it. I could not wait to put the things I had seen these players do into practice on Monday afternoon after school! This week makes me think of him a lot as well. I miss you Grandad, and wouldn’t be writing this if not for you! PreviousMasters Week – PGA Return To Agusta! Follow Jay’s Florida Golf Adventure! Great post! I actually did the same thing with my Grandpop, who was also my first coach, and some of the best memories I have growing up are watching The Masters with him every year.